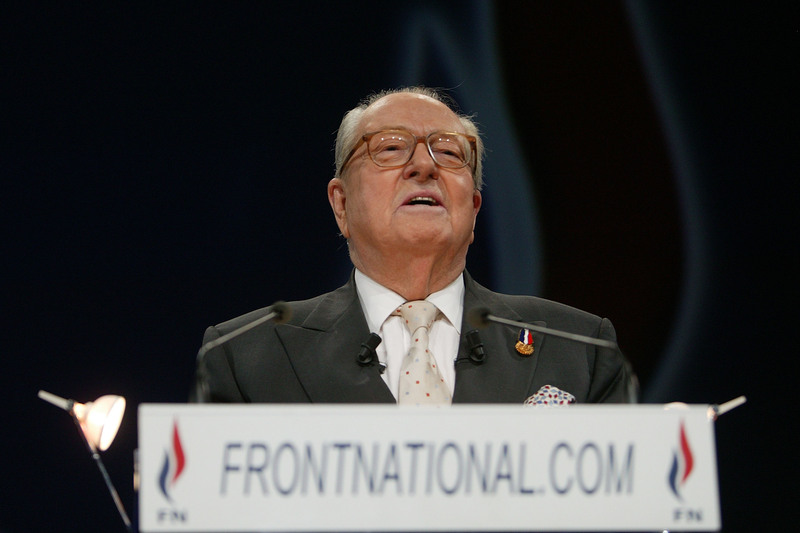 In the new memoir of Jean-Marie Le Pen, founder of France's Front National, the powerful currents of resentment and authoritarianism that animate the far right are well on display. Review of Mémoires: Fils de la Nation (Muller, 2018). Le Pen loses his father when his fishing boat is blown up by a mine off the coast of Brittany in 1942. The authorities declare him a “ward of the state.” This is a matter of huge symbolic significance to Le Pen, keen to cultivate a self-image as a providential figure, part victim, part hero, who leaves his native Brittany to make his way in the big wide world. Adopting a self-congratulatory tone throughout, Le Pen’s memoirs offer a window into the powerful currents of resentment and authoritarianism that animated far-right activists through the upheavals of postwar France. The book begins with the author’s adventures growing up in rural France and becomes increasingly focused on politics, addressing France’s wartime occupation by the Nazis, its painful decolonization process, and the general strike and student protests of May 1968. Along the way it offers snapshots of various political events and figures, from General Charles de Gaulle to the reactionary movement led by shopkeeper Pierre Poujade in the 1950s. The tale of the “son of the nation” is one of derring-do and happenstance. Brave Le Pen always seems to find himself in the right place at the right time. As head of the law students’ union, the Corpo, he calls President Auriol and offers to head up an aid mission following flooding in the Netherlands. He becomes France’s youngest parliamentary deputy in 1956 as part of the Poujadist movement. He enlists for France’s colonial wars in Indochina and Algeria and then finds himself running the election campaign of a former Vichy official, Jean-Louis Tixier-Vignancour, in 1965. By the early 1970s he is being approached to lead a new far-right nationalist initiative, the Front National. Le Pen paints himself as a man seeking only to serve his greatest love, France. A little Breton boy who adores nature and animals, is enchanted by Paris and who, when he grows up, becomes irresistible to women, inherits a massive fortune (in suspicious circumstances, not mentioned here) and sails the Pacific and the Atlantic. He is a man apparently oblivious to his contradictions. The thrift, hard work, and sacrifice of rural life he describes at length are at odds with the thoroughly bourgeois existence that falls in his lap after his inheritance brings him chateau life in a well-heeled neighborhood of Paris. He is a man of destiny in awe of the rich and famous. A man who met De Gaulle not once but twice. A drinking companion of the musician and author, Boris Vian. A friend of the film director Claude Chabrol, who one day even met and talked with Orson Welles in the Luxembourg Gardens. A man who brushed shoulders with people who knew still more famous people than this, and who sometimes got invited to dinner with them. Alongside this image, a curious fusion of Tintin and Forrest Gump, the book reveals another, more familiar one: the thuggish racist who became the most loathsome figure to have polluted postwar political life in France, quite an achievement in what remains a congested field. Le Pen was a pivotal figure in the rehabilitation exercise that has seen authoritarian racism find its way into corridors of power around the world, from Washington to Rome. This volume ends with the formation of the Front National in 1972; over the four decades that followed his FN did more than any other organization in France to make racism respectable. Two things become abundantly clear over the course of its 450 pages. Firstly, the greatest love of Jean-Marie Le Pen’s life is not France at all, but Jean-Marie Le Pen. Secondly, he remains a man defined by racism, antisemitism, Holocaust denial, violence, authoritarianism, dishonesty, and narcissism. Transmitting an authoritarian outlook steeped in France’s longstanding far-right tradition to younger activists is part of this book’s job. Le Pen acknowledged as much by launching it at the La Librairie Française bookshop, a focal point for far-right activists. Le Pen’s grasp of the importance of this legacy is evident in the approving references to Spanish dictator Francisco Franco and collaborationist writers like Charles Maurras and Robert Brasillach, as well as in his sympathy for Vichy, his downplaying of the impact of the Occupation, his justifications of the French army’s use of torture in Algeria, his defense of his notorious remark describing the Holocaust as a “point of detail,” his belief that the “white world is dying,” and his identification with the racist notion of the “great replacement” whereby white Europeans are supposedly being displaced by North Africans. Self-congratulatory indulgences aside — “I’ve had a beautiful life” — a constant undertow of bitterness pervades the book. Why is this? Part of the explanation lies in Le Pen’s current marginalization, following his expulsion from the FN by his daughter (now leader of a rebranded “Rassemblement National”) Marine Le Pen. The book’s chronology, mainly focused on the era of military defeat, occupation, the postwar purge, and decolonization, is another. The sense of failure and isolation generated during this period, peaking with May 1968, was to have a lasting impact. The autobiography therefore turns around a “tragedy”: as Le Pen grows in stature, his nation “shrinks” as never before. “This strange phenomenon,” he notes, “was the great disappointment of my life.” Responsibility lies not with the hardworking man of providence Le Pen, but with those governing France. The country’s fate is epitomized by the abandonment of selection in universities, allowing mediocre individuals to use study as a way to delay their entry into working life. Le Pen’s exaltation of the value of work and of sport as a route to physical and moral improvement is contrasted with the relentless decline of a nation beset by immigration, permissiveness, and the distortions of May 1968. Things begin to go wrong for France at the Liberation from German Occupation, with the “unjust” purge of collaborators and growing reverence for the Resistance, whose “terrorist” methods are later to provide inspiration for Algeria’s National Liberation Front (FLN) in the 1950s and, more recently, ISIS. Matters get worse with the wars in Indochina and Algeria (Le Pen served in both) and reach a nadir with De Gaulle’s “betrayal” of the nationalist cause as Algeria gains independence. Le Pen was part of a generation shaped by these defeats. One opportunity to build an organization that united the extreme right and wider nationalist forces came in the 1950s with Poujadism, a dynamic movement of chauvinist discontent that Le Pen played a significant role in shaping. The “greatest regret” of Le Pen’s political life concerns a less well-known episode, the Tixier-Vignancour presidential election campaign of 1965. For Le Pen this was a chance to capitalize on opposition to de Gaulle and head off the events of May 1968. In his view, Tixier’s election committees ought to have been transformed into a united nationalist party but the chances of this happening were blown by the candidate, who remained trapped in an alienating, theatrical political style. Since destiny does not grant him the status he craved, Le Pen busies himself with other matters, running a small record company specializing in political memorabilia. Along the way he is convicted of apology for war crimes after producing sleeve notes accompanying a recording of Hitler’s speeches that stressed the “democratic” nature of the Nazi party’s rise to power. Though the narrative ends in 1972, the book also offers some oblique insights into the public drama that played out with his daughter Marine in more recent years. The successor to the FN throne, she expelled him from the party in 2015 after one antisemitic outburst too many. Although Le Pen identifies strongly with the Vichy slogan, “Work, Family, Nation,” castigating the role of feminism in distracting women from their “sacred duty” to bear and bring up children, such strictures are very much for others to live by. He appears indifferent to his own three children. Pierrette, his first wife, and he were “more husband and wife than parents,” sailing the world as he dabbled in politics while employing a nanny for thirteen years to undertake all the sacred parental duties. Le Pen identifies with the notion of inheritance developed by Charles Maurras, leader of the far-right Action Française and intellectual inspiration for the Vichy regime. His own truculence is certainly recognizable in the bloody-mindedness of his grandparents who continued to live in close proximity after falling out, taking care of their five children without addressing a word to each other for a full two decades. The pettiness of such episodes offers some indication as to why Le Pen was never the “man of providence” he imagines himself to be. The fact that this book immediately sold out of its first print run of 50,000 copies and entered the bestseller lists is nevertheless evidence of how the French extreme right has been able to recover from the defeats described here and create a significant audience for those, like Le Pen, who have reshaped France’s fascist tradition for a new era. Jim Wolfreys is the author of Republic of Islamophobia: The Rise of Respectable Racism in France (Hurst/OUP, 2018).